Show Racism the Red Card’s sixth annual Fortnight of Action takes place in Scotland from 16th - 31st October, 2009. Show Racism the Red Card’s annual Fortnight of Action takes place in Scotland from 16th - 31st October, 2009. 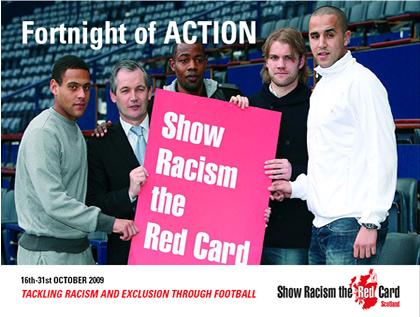 SRTRC wants to engage with, and provide assistance to, groups who have been traditionally excluded from football as part of this year’s Fortnight of Action. Assistance is available through the SRTRC Action Grants scheme, SRTRC resources, and red cards are available free to schools, local, amateur and junior leagues to join the pro players ‘showing racism the red card’ before kick-off. Grants are available to non-statutory organisations including community groups, schools, youth clubs, fans associations, tenants associations and other grassroots bodies that are working to engage with young people, ethnic minorities, excluded groups, football fans, and refugees and asylum seekers. Download the Fortnight of Action Scotland Booklet here with information on how to apply for a grant and get resources for your project. For more information on grants during the FOA please get in contact with our Scotland office here.